Of course, the Rio Grande is not just grande. It's largo (long). Longer than grande, in fact. The part we're in is the easternmost end, waaay down in the southernmost tip of Texas. There's a strip of Hwy 83 running from Harlingen and Brownsville (just ashore from S. Padre Island) westward through numerous adjoining towns to Penitas (technically, a 140 mile line up to Zapata!). Spread along that belt are some 500 RV parks and resorts, many of which bring in entertainment for their guests (known as "winter Texans"). For the last two winters, we have been both winter Texans and entertainment. Our first winter here was sorta lean because we came without knowing The System here. ...but, the way it works in the RGV is a very different deal. Performers pay to perform at a "showcase," an event where hundreds of Activity Directors attend two days at a designated RV park's clubhouse/showroom and watch entertainers audition. Each act gets 9 minutes. It's tough to show what we do in 9 minutes, but it's even tougher to make it from wherever we are to the showcase, which, by necessity, is very early in the season before. This idea is spreading because it's so convenient for Activity Directors (not to mention lucrative for the showcase promoter--the only showcase in the RGV now costs $50 for a 9 minute "audition"). Well, last winter we did that (a mere $20 then), and garnered 17 bookings--not really enough to support us in the manner to which we would like to become accustomed, as the saying goes, but enough to warrant our being back here this season. We'd like to share some highlights and photos of the fun and folks we've been enjoying here. 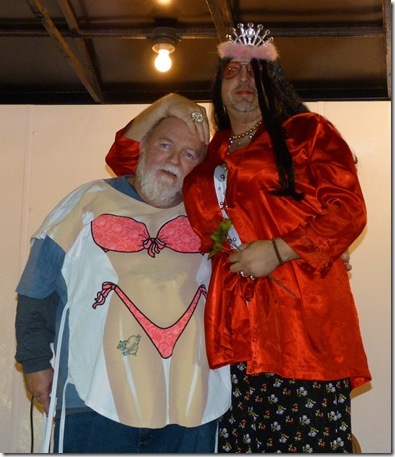 Here's a shot of a couple of audience members at--where was that again?--Oh, yeah...Paradise Acres in Alamo, mid-December. Toward the end of our shows we've been inviting folks to come up after the show to try their hand (and foot) at the washtub bass. This started as an offshoot of our workshop, "The Laundry Lesson," which we present at festivals to introduce those interested to the washtub bass and the rhythm washboard. Since we started doing this, it's become quite popular, as you'll see. For a night out, we went to see our friends and fellow performers Larry & Melissa Beahm of One More Time presenting their Christmas show. This is their rendition of "Meli Kalikimaka," which accounts for the grass skirt and lei over the Santa and elf costumes. And you think we're unusual! We love their show! Check 'em out. www.omtmusic.com. Really fun crowd that night. Judy was a little nervous she was gonna be replaced by an enthusiastic audience member, who graciously backed down when she learned carrying heavy equipment was part of the gig! at 10:33 PM 0 Comments! at 4:17 PM 0 Comments! We spent a lovely summer "camped" at the centennial farm of a dear friend in the cool, verdant north woods of Michigan's lower peninsula. All was well until the day before we were scheduled to leave for a gig downstate at an independent living community (our day job). We wanted to shower, of course, so, as he left for town our host advised us to put another log in the outdoor furnace so there'd be plenty of hot water. He had injured his hand quite severely feeding this beast the preceding winter, so Whitt was being very cautious as he shoved the 4-foot log through the furnace door; then he watched in slow-motion horror as the log end trapped his left index finger between the log end and the edge of the steel opening! Yes, he played the next day, and for a week or so thereafter, changing the gooey customized bandaids after the performance and reapplying the liquid bandage--truly a miracle product of the age! at 2:33 PM 0 Comments! at 10:32 PM 0 Comments! There's an annual festival in Michigan we want everyone to know about--the Original Dulcimer Players Club music fest in Evart, Michigan the 3rd full weekend in July. Dulcimers.com It's way more than a dulcimer fest, but be assured you will hear truly amazing hammered dulcimer playing, even at 2:00am most nights! This is not only an affordable and enjoyable festival--it's well organized and includes hours and hours of excellent workshops in a wide range of music and performance related subjects. 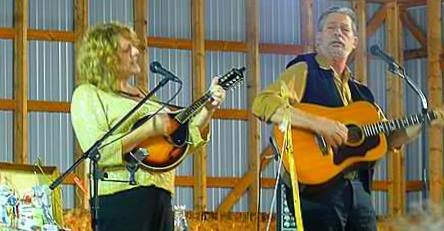 We usually present two workshops, one of which is on Humorous Songwriting, where we teach (in the barns and chicken coops) an overview of types and structures, perform examples, and provide tips on methods. Time permitting, participants share their efforts and, when they request it, Whitt helps them work out any problems. Our other workshop, The Laundry Lesson, usually draws a large group interested in learning about the washtub bass (our notorious trademark) and the rhythm washboard. We present detailed information about construction and use of these traditional, home-made instruments. Participants often bring their own inventions to share. There's usually some time for folks to get a hands-on try at playing ours. Whitt lays down a little chord progression and class members get to see how the techniques really work and where the instruments fit into an arrangement. Of course, since the washtub is played entirely by ear, folks quickly realize that it's not quite as easy as it looks! This festival is a lot of fun, and we often run into old friends there from all over the country! Next summer you're in the "pleasant peninsula," check it out. at 7:11 PM 0 Comments! at 6:46 PM 0 Comments! This gets our "Best use of possible space" award for sure; but, it also gets the "What was so hard about that?" award for being the only promoter or medium to get our name right consistently! We have been extensively promoted as "The McKinley Washtub Two"...also "McKinney Washboard Two," "The McKinny Washtub Two" "The McKiney Washtub Two", "The McKinney Washtub Two Band," "McKinney Washtub II," and "Englebert Humperdink." The latest addition to the Mckinney family name walk of fame is "The Mickinney Washtub Two". So, we're part Irish...no need to call names! "Washtub, Comedy, Two" for which we are entirely grateful! And, completely off the wall, we were called "The ubiquitous Steve & Holly" by someone at the Moon Shadow in Tucker, Georgia. "McKinney Duo," and "The Washtub," (So now we're just opening for the washtub!) also "Husband & Wife McKinney Duo." "Olde Tyme Washboard Dance with The Olde Tyme Washboard Band." We kid you not. Actually, we'll give 'em a few points for the "Old Tyme" just for creativity, but we're subtracting them due to the excessive use of the "e" ending. And, no one danced. Dec 2009. Our latest permutation was printed in a full-color glossy monthly newsletter, where we were billed as "Washtub Band with Whitt & Judy" (always happy to be included) and we also got another mention on the back page as "McKinney Washtub Band." Still a mystery to us why the country seems to be suffering a dearth of "The"s.
March of 2010. There have been a lot of duplicates we won't bore you with. The only two new ones we have to add in three months of touring (c'mon Activity Directors where's your muse?!) are "Washtub Duet", which we'll leave you to make up your own subtitle for, and the simple yet elegant "Washtub Trio", a variation on a familiar theme. "The Tub Act", which may be an unnatural act, "The McKinney's"(we own them you know) "Wash Tub Two", and, of course, with a slight variation on a popular theme, "WashBoard Duo"
Then they scribed "Was Tub Music" (Vas is das?) This was written in beautiful neon letters on a backlit black sign. "The Washtubbor" made it seem Judy works alone & only plays the washtub--not only extra pressure for Judy, but probably rather boring during the second hour! And finally, "The Mickiney Washtub Two". this one at all! Sheesh, gain a few pounds and the name-calling starts! 2012, in the Rio Grande Valley, we hit a new level. We were listed in the paper, and at the performance (they were consistent anyway) as simply "McKinney". What can we say? And, what can compare to the thrill of seeing our name in dry-erase marker? ..."for Two"! Okay, but that's not a very good turnout. Stay tuned for our latest incarnations--the hits just keep comin'!" at 11:15 PM 1 Comments!